With all the hoopla that surrounds the casting of superheroes in movies, it’s a wonder that no one ever tried to get Tom Cruise in a cape and mask. In nearly every movie he’s in, he’s speeding through the streets, fighting bad guys, dodging gunfire, running to and from explosions and treating death defying stunts like a stroll through the parts. Even when it comes to the tabloid field-day that is his personal life, Cruise is almost indestructible. Seriously, how has this guy not been tested as Superman or Batman?! 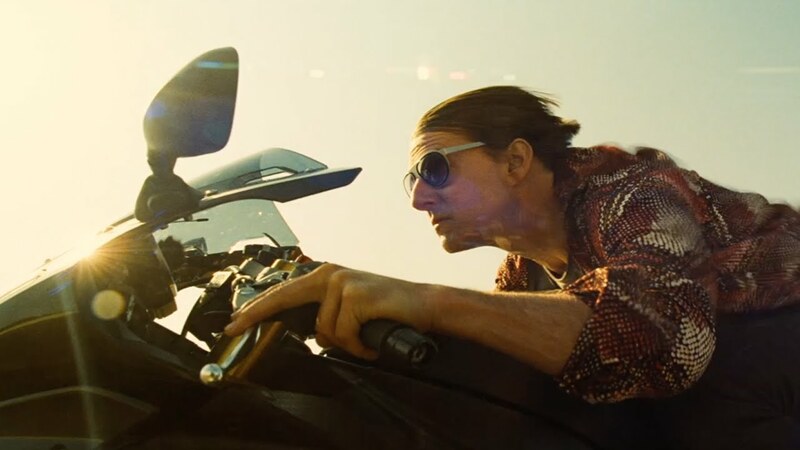 Regardless, Cruise is back as international capeless crusader Ethan Hunt for a fifth time in Mission: Impossible – Rogue Nation. M:I 5 revolves around Ethan (Cruise) and his covert search for The Syndicate, a team of missing or presumed dead international spies working to incite global chaos. Ethan’s search has been tough, especially since CIA big shot Alan Hunley (Alec Baldwin) is trying to dissolve the IMF due to their chaotic history. Fortunately, Hunt got backup in tech savy Benji (Simon Pegg), cool Luther (Ving Rhames) and by-the-books Brandt (Jeremy Renner). Hunt also has an uneasy alliance with Ilsa Faust (Rebecca Ferguson), a former British Intelligence agent who may or may not be working with The Syndicate. Together, Ethan and co. trot the globe looking for The Syndicate’s leader (Sean Harris) and trying to stop their plans for global anarchy. The quality of a Mission: Impossible movie all depends on who’s directing it, whether it be the subtle slickness of Brian De Palma, the overblown machoness of John Woo, the spastic flashiness of J.J Abrams or the stylized fun of Brad Bird. Writer/director Christopher McQuarrie, who worked with Cruise in 2012’s underrated Jack Reacher, seems to bring a touch of darkness to the M:I franchise. Characters are mostly wearing black, the action is rougher, the physical damage from the stunts is more noticeable and there’s a heightened sense of fear coming from the villainous Syndicate. McQuarrie seems to be the first director to take the sense of global terrorism really seriously, and he wants to see people die instead of just beat up and brushed aside. It may be the first Mission: Impossible movie to highlight how hard it is to be an IMF agent or, more specifically, Ethan Hunt. Tom Cruise was 34 when the first Mission: Impossible came out and he had to silently repel from a ceiling and fight on a high-speed train, which is still pretty demanding. Now, at 53, Cruise hanging off of a giant plane, holding his breath underwater for over three minutes, getting beaten up by young Dolph Lundgren clones and chasing down bad guys mere minutes after dying from suffocation…….HOW IS TOM CRUISE NOT SUPERMAN?!?!?!?! But, like other M:I movies it’s not all about Cruise. Simon Pegg is the best he’s ever been as Benji continues his time as a serious field agent. He and Cruise are together for most of the movie, almost turning it into a buddy cop adventure. Rebecca Ferguson may be the best female character in the M:I movies, as she (literally) climbs and crushes bad guys with her bare legs, even holding her own against Cruise. She’s not a love interest, more so a reflection of Ethan and the damages of spy life. Alec Baldwin is slimy, stuck-up Alec Baldwin here, which of course is the best kind of Alec Baldwin. The late Philip Seymour Hoffman was the best villain (and perhaps best actor) to be a part of the M:I franchise, but Sean Harris comes damn close with his stone cold killer leader. While the darker tone does keep the movie and franchise fresh, a slight touch of humor could’ve taken the movie to perfection. And really, that’s the only complaint in the best action movie this year since Mad Max: Fury Road. Even with internet complaints of expanding franchises and cinematic universes, Mission: Impossible seems unphased by the constraints of other franchises. With Tom Cruise promoting this installment and already talking about a sixth movie, it’s hard not to wait in anticipation for accepting another one. As long as Cruise is there to continue to defy the laws of physics, sign me up. This entry was posted in Movie Review and tagged Brad Bird, Brian De Palma, J.J. Abrams, Jeremy Renner, John Woo, Mission: Impossible, Simon Pegg, Tom Cruise. Bookmark the permalink.